Stop me if you’ve heard this. Marvel Studio puts out a trailer to one of their films that you haven’t seen yet and you already know that it could be one of the most beautiful things you will put your eyes on this year. The newest and last Guardians of the Galaxy Volume 2 trailer has hit the interwebs and nobody is shocked at how amazing it looks. So let’s dive into what Peter, Gamora and the rest of the crew has in store. It opens with the another clip of the giant alien squid creature fight with Peter playing with a device that turns out to be Mattel’s Classic Football Handheld game. Gamora pulls out a rifle and Peter is a little surprised by it, thinking that he was the guns guy. Pratt plays it off pretty well for a nice moment of comedy. After a shot of Drax and Rocket, we see Baby Groot hook up Peter’s Walkman as the bass line from Break the Chain sets the tempo for this trailer. Our first real look at Ayesha is her addressing the team along with quick shots of the ravagers possibly capturing Rocket and Gamora seeing Nebula for maybe the first time since the first film. The action picks up with Peter flying a ship and yelling for Groot to put his seat belt on. Yes, the image of this tiny plant eating what looks to be candy is just as adorable as I’m describing it. I really think the use of slow motion could be a big part of the effects in this film because of the huge amount of darts, I think set by Rocket, flying at some really unlucky guys. 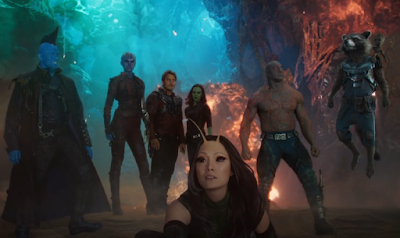 There’s the typical roll call of the team but Groot’s is awesome because he is so tiny and waving at Gamora while she’s clearly fighting the giant alien squid. Nebula accuses the team of not being friends since they fight all the time and Drax turns into a philosopher and corrects her by saying, “No, we’re family”. He continues on by suggesting at Nebula “except maybe her.” But the biggest reveal, which is really just confirmation, is that Kurt Russell is Peter’s Father. I don’t need to see anything else from this movie and in fact, I'm really glad that this is the last trailer. What Doctor Strange showed us was an entire new look to these films but I think this could be just as colorful as the Sorcerer Supreme's solo movie.People will show up to see this movie regardless of when it’s released and I feel like Marvel has another home run on their hands.